Akokala Lake is one of the last bull trout supporting lakes on the west side of the park and is at risk of invasion by non-native lake trout, which are known to have severe detrimental effects on native fish populations. The drainage is also susceptible to invasion by rainbow trout and possibly brook trout. Monitoring and genetic testing show hybridization between westslope cutthroat and rainbow trout has already begun to occur in Akokala Creek. Brook trout can out-compete westslope cutthroat trout and hybridize with bull trout. The environmental assessment analyzes two alternatives: 1) Alternative A-No Action, and 2) Alternative B-Construct a fish passage barrier on Akokala Creek. The preferred alternative is to construct a fish passage barrier (Alternative B). A fish passage barrier would prevent additional non-native fish from accessing Akokala Lake and the upper Akokala drainage, and reduce or eliminate further expansion of westslope cutthroat-rainbow trout hybridization. By protecting the drainage against non-native invasive fish, this project would also help safeguard important habitat refugia for native fish confronting the stressors of climate change. The environmental assessment, as well as additional information is available at http://parkplanning.nps.gov/AkokalaFishBarrier. 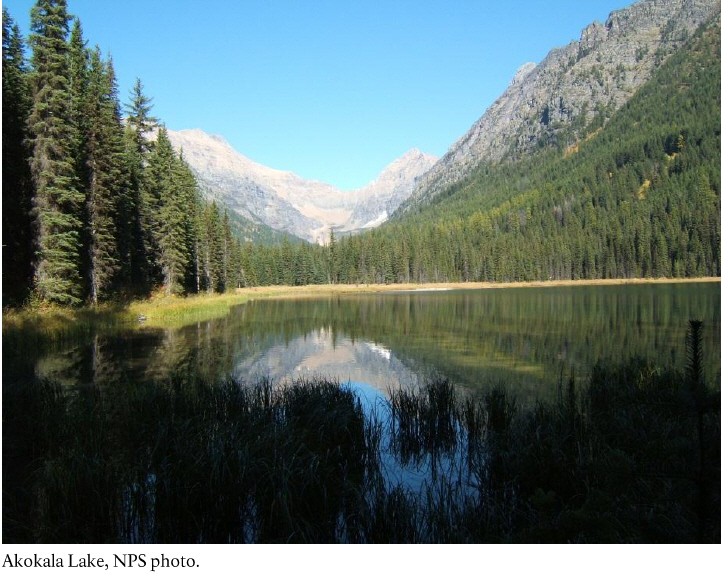 Public comments can be made directly through this website, or written comments may be mailed to Superintendent, Glacier National Park, Attn: Akokala Fish Barrier EA, PO Box 128, West Glacier, Montana 59936. Personally, I support the fish barrier due to the risk to native specifies from non-native species. ← Who are all those people in your stories? I also support the barrier. The fishing streams in western Montana have been badly damaged by the illegal introduction of non-native fish such as pike and the widespread damage to our lakes by lake trout. We need to save as much natural habitat as we possibly can! I hope they’re able to set up a workable barrier. Glacier goes to a lot of trouble to inspect incoming boats to make sure invasive weed species don’t get in. Restricting fish is another protection for the good of the park. The inspections are being done all over western Montana and have been for several years. It’s a very good thing.